Our first fruit has landed. After spending the last few weeks racking, blending, processing samples, doing maintenance, and painting floors – a lot of painting floors – we were crawling out of our skins with the news that four little tons of Gewurztraminer would come trickling onto our crush pad. Really it was more of a gush: the truck backs up to the hopper, tilts its bed to the hilt, and the fruit comes splashing down. We all gathered round, glints in our eyes, champagne flutes in our hands, toasting to a good vintage despite the hurdles ahead. We stuck our hands out into the waterfall of fruit as it poured down, to grab a sample for the lab, taste the berries, scope out the rot – out of both curiosity and necessity; the winemakers will base their judgments about how to crush, press, and make additions based on the quality of the fruit and the intended destiny of the finished wine. As with California’s 2011, one of the major challenges this vintage will be keeping botrytis out of vineyards and wineries and laccase – the enzyme botrytis produces – out of ferments and wines, since it acts as a browning agent and disrupts the settling of particles in the wine. Then we crushed it. And as promised, a pump beneath the destemmer pushed first the free-run juice and next the must straight out of the crusher, into a fixed line, up from the pit, above and across the crush pad and right into the press. It all took some finagling, careful monitoring, and a lot of judiciously pressed buttons, switches, levers, and nozzles. The whole thing was far more mechanical than at Donelan, though hardly automated. There was plenty of climbing into and out of machinery, a lot of judgment calls about valves and suction and pneumatic doors and sump caps and press cycles. The same kinds of considerations about efficiency and fruit quality and volumes and Tetris that I encountered at Donelan come about here in completely different terms. 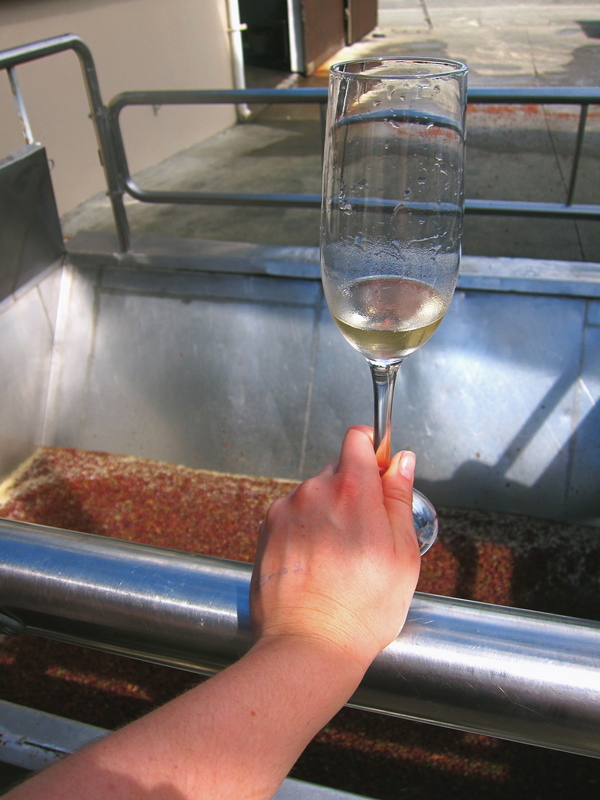 Unlike reds, whites get pressed before they begin fermentation. After crushing it, we gave the Gewurz an hour of skin contact just stewing in the press to extract some tannin and flavor from the grape skins; then we pressed it. Unlike the basket press at Donelan – where a pneumatic plunger descends into a cage, compacting the cake as the juice trickles out the sides – we’re using a bladder press. This is a massive cylinder of steel and screens partially lined with an inflatable bag. When inflated, the bag creates enough pressure to push the fruit against the screens, where the juice filters out. The cylinder rotates and the bag inflates and deflates at intervals determined by a programmed cycle, breaking up the cake, getting around to all the berries. Using fixed lines again, we pumped the free-run and press juices into separate tanks far away from the press. Walkie Talkies featured. When it was over, I had an inaugural clean – first of the destemmer, then of the press. The Donelan destemmer was once my biggest nightmare – Norm, I named it, like a senile old man who needs help putting in his dentures and tries to kill you when he doesn’t recognize you. This thing is a whole other story. You pop open its doors, pull the augur out enough to peek your head in, then you hose the damn thing like mad. No scrubbing, no dismemberment of the machine or of the intern. Just water. Potential nightmare factors include: after a day of crushing a hundred tons, the walls of the pit will literally be painted with fruit; hosing down the machine while truck drivers are yelling at you to hurry up; getting soaking wet while cleaning it when it’s 40 degrees F in two months. I’ve been learning a little bit about international sanitation culture. 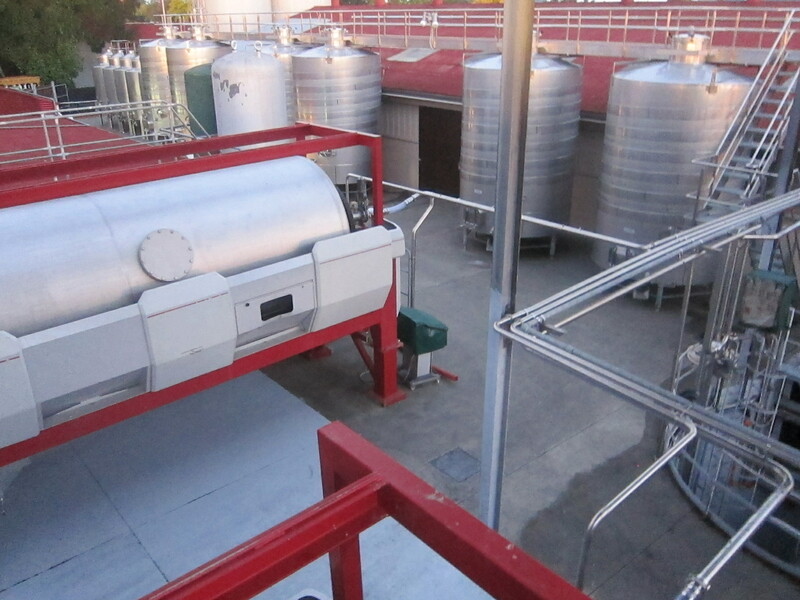 American wineries are more stringent about sanitation than any other winemaking industry on the planet. The worst being the French, with their thousand year-old wineries housing yeast strains and bacteria that produce that old-world French wine taste. New Zealand is proactive about sanitation and I’ve already documented the powerful cleaning agents used as a matter of course. But cleaning things like destemmers and presses and sorting tables – these were endless tasks last harvest precisely because we didn’t want to leave a single berry or seed or splash of juice behind. Because of fruit flies and VA and slippery slopes. And it was just amazing how it could keep coming; how you could clean something for an hour and STILL be finding stray berries. Where do they even COME FROM?? 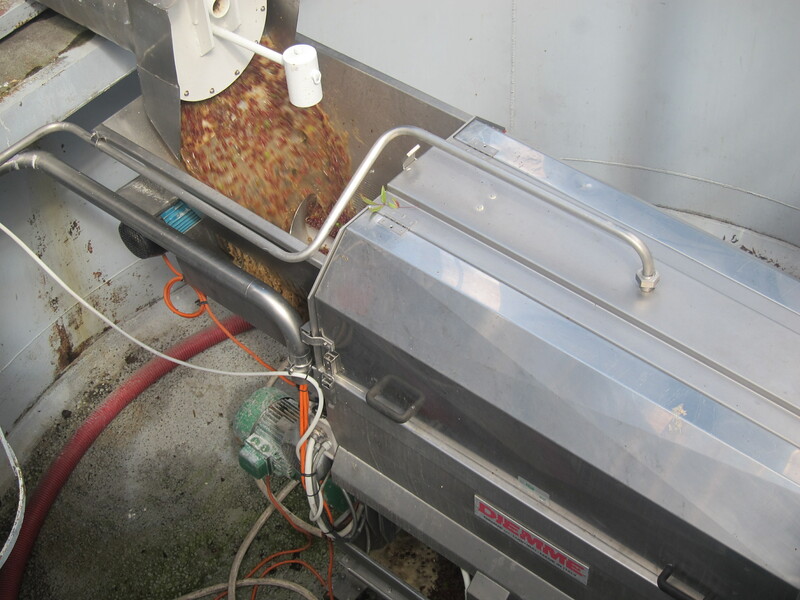 I hosed off A LOT of fruit after our first crush here in NZ, as instructed: until everything was visually clean. They won’t bring out the heavy duty cleaning gear until there’s build-up on the equipment. Just water after every lot goes through, citric-sulphur first thing every morning, and caustic when things start to look manky. To clean the press, you open the big cylinder’s doors so that it dumps out the skins, then get in and hose everything forever until it’s all gone. This involves some Mission Impossible-style swinging and climbing. I felt like I was crawling around in the ventilation system during a heist. At the end of 12 hours, I had that familiar, fantastic feeling that brought me all the way down here in the first place. Sore. Soaked. Famished. 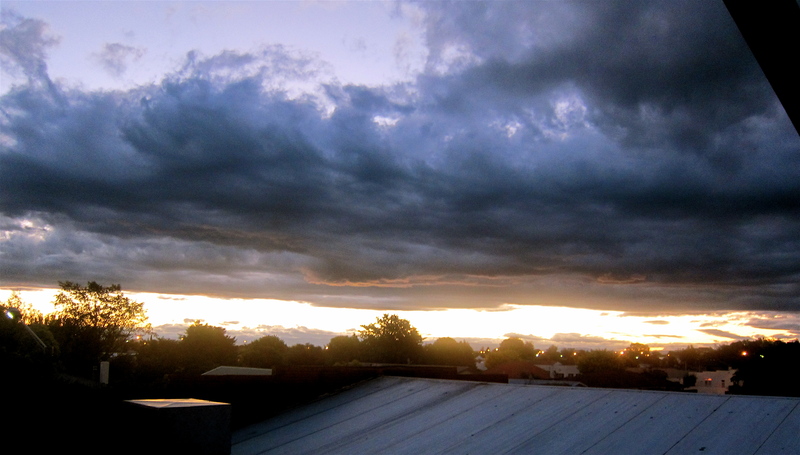 Dying for a beer, which we cracked open in the embers of a late summer evening, cement still baking from a scorching day. Exhilarated. Ready for more. Ready for a shower.